This month brought to us, and much of the nation some very cold weather. PA does have winter weather but it is usually not as severe as NY weather. Many events in life are relative and with other places we have lived in, the cold weather was rather nippy but not really serious. We did have snow on the ground but not too high for real worry. Our home is a total electric residence and our heating is electric. So, no worry about oil delivery and PP&L generation is mostly coal-based from mines owned by PP&L. Nevertheless, situations such as this empathize how little control we really have over such basics as heating and staying warm in winter. The news reported that the Governor of Ohio had even turned to prayer as this was a one hundred year storm for them. Of course, prayer is a positive action and it may have some positive results but just possibly there is an issue of preparedness. We were in good shape and of course, wished the same for others affected by this weather. I mentioned the Marriage Encounter weekend last month. This was a very positive experience for us and though quite programmed, it was very personal for us. We did attend the follow-up sessions often and would recommend the program for any couple seeking some more insight into their married lives. In February I lost some time at work and felt that I was coming down with some illness. I had trouble concentrating, I felt weak and spent at least half of a day in bed. I did feel better the following day and returned to work. Looking back to 1977 now in 2018, I wonder if this was the beginning of another pneumonia episode as the symptoms sound familiar. I’ll never know, but it could have been. Ingrid and Louise are over their illness and we hoped for a cold and flu-free winter. I was taking another course in auto repair for the car owner. I enjoy hands-on work such as this and the knowledge is valuable in maintaining a car and doing the basic repair tasks. Right now in the middle of winter, the weather is too cold for car servicing. I think I mentioned earlier that we had some muffler work done on the Chevrolet. The stress of the new parts that connected with the replacements was too much so I had the remaining parts replaced too. It could be bad if the muffler failed in traffic and perhaps I was too frugal when I had the earlier work done. I learned that a prior friend from GAF days was working in the area and invited him over for dinner. Unfortunately, there was a bridge on the route that I outlined which closed for repairs. But he made it anyway though it did take longer than expected. He and his wife had taken the Marriage Encounter session and we had this in common as well as our time working at GAF. Margery added comments of her own. I think this is the first time, so I shall include it exactly as written. It finally occurred to us that I could also write some of this, so here it I am. It is snowing at the moment but it is not supposed to last long. the girls had three days of closed schools, but are back now, as our schools are oil and coal heated. While out, Ingrid made herself a wool jumper which is almost finished, so the time was not wasted. I have been on a sewing streak, having made some things for Christmas and a long gown for Ingrid to wear for her concert. Then after Christmas, I bought some dark green velvet, on sale, and made and finished!! a suit. I am very pleased with it and wore it out to dinner with some friends. Ingrid has gotten her hair cut, and it looks very nice indeed. It is about shoulder length, and the turns it under, somewhat like a page-boy only looser. My hair is the most pleasing to me that it has ever been, being quite short, and easy to care for. Bob got me a hair blower for Christmas and in using it that I look more consistently nice that I have ever been before which is a nice feeling indeed. Louise and Ingrid both are now involved with after-school volleyball and enjoying it very much. They play a lot of it in our campers group and they plan to surprise the campers with their improvements in that line. Louise continues her violin, and after this school year, she will need a private teacher, as the school switches in the 5th grade to a sort of ensemble rather than lessons. She got a telescope for Christmas and has looked at the moon, and found Jupiter with 4 of its moons. We discovered that it cannot be used effectively indoors, i.e. through the glass patio doors, so since it has been so very cold she has not been using it. Bob spoke o our Marriage Encounter weekend, and I want to say that it has been three weeks now since we went, and we see real changes in our relationship. Good changes, involving more openness between us. It is hard to describe in general terms – something like trying to convey what a concert meant to you by saying we went to the concert hall and there was such and such a piece played when each person was affected differently. 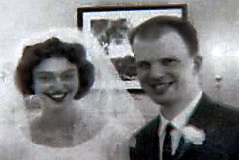 In some ways, it was more like being married than our 1960 wedding was, and I do not use superlatives lightly. This entry was posted in 1970-1980, Allentown, Binghamton, Coopersburg PA, Marge Writing, memoir and tagged children, family, feelings, life. Bookmark the permalink.